Milus adds to its signature collection and reinvents its iconic Tirion TriRetrograde with a new 42 millimetre diameter and two dial options, each one a statement piece. The "Skeleton" model is about transparency and avant-garde design. The anthracite inner bezel ring circles the triretrograde mechanism which is set against a sandblasted grey background. The watch's technical appeal is heightened by the tiny blued screws that secure the silver-toned bridges. 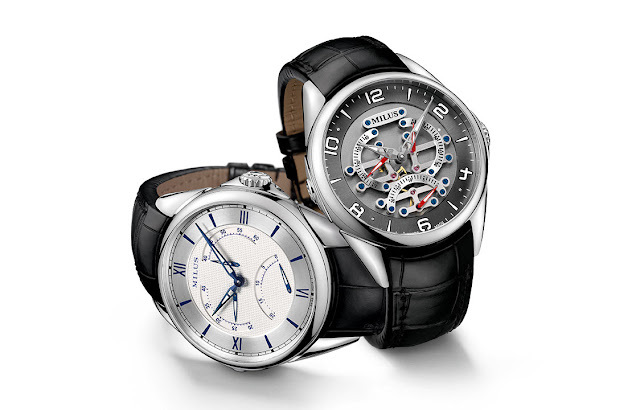 Classic yet contemporary defines the "Clous de Paris" variant. The centre of the white dial is embellished with a delicate guilloché motif. Luminescent, skeletonised hands, in anthracite and red or in blue, measure the seconds on three segments, brought to life by the exclusive 3838 calibre.